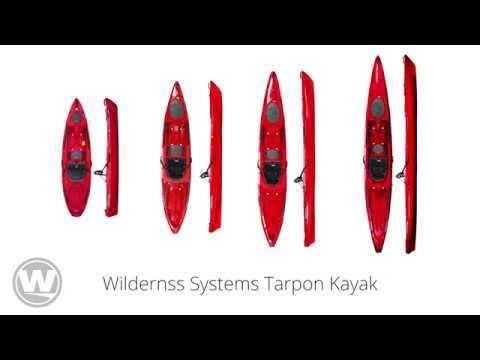 The new Wilderness Systems Tarpon 140 kayak delivers improved speed, better glide, and even more storage than its smaller counterparts. The Phase 3 AirPro seating system adds comfort and easy adjustability. For 2015, the Tarpon 140 features the Keepers XL footbraces which offer larger triggers and adds 5" of rail. The hull and deck have been fine tuned to offer increased performance while still maintaining the stability to stand and cast from the flat floored seating area. This well rounded sit-on-top is capable of adapting to a variety of water conditions by combining small kayak maneuverability with large kayak speed. This is the second tarpon 14 I have owned. Somewhat disappointed over the lack of container for dry storage in hatch by the seat. Older version had a bag which mounted on the hatch edge. The hook on the seat strap broke on the second trip out, hope this isn't a sign of things to come. Anchor trolley and rudder system is a definite plus. An excellent sit-on-top kayak with a VERY comfortable and highly adjustable seat. It tracks well, is quick and has plenty of convenient storage. It's a bit heavy, but manageable. I would highly recommend the Tarpon 140! An excellent kayak with a very comfortable seat! The Tarpon 140 is quick, tracks well and has plenty of convenient storage. The weight is a little heavy, but manageable. I would highly recommend it! Tarpon 140 was purchased on the web site and delivered to northwest Indiana. I put in the order on a Wednesday and it showed up in my driveway on Friday. Very excellent service. I like the kayak, although it will take some getting used to since I have previously been fishing in a Commander 140. This is a whole different setup. It paddles very well, very speedy, being a narrower boat and a rounded hull rather than a pontoon hull like the Commander. Paddles good into the wind because of the low profile. I have only fished with it a couple of times but I think I will like it for its intended purpose which is getting out on bigger water such as Lake Michigan. Second Wilderness Systems kayak purchased, first was a Pamlico 145T. Use the Tarpon on inland bays and estuaries. Had been used to an Ocean Kayak Drifter for 20 years, which is extremely stable in all conditions but a bit of a "tug boat". Tarpon definitely a big step up in comfort, tracking and speed. I am 6'2" and about 245 and it is important for me to go out in various conditions and not worry about being "tippy". Was out in some strong wind and swells first time out and took little getting used to from what I had been paddling. Handled chop very well, had to get used to stronger tracking as my basically flat bottomed Ocean Kayak could be turned quite easily "surfing" on swells. Stronger tracking and speed definitely noticeable on longer trips (2-3 hours, 6-9 miles), got to where I was going and back with more efficiency and less effort. Seating very comfortable, like the adjustments you can make. Definitely would recommend for anyone with a larger frame looking for some good performance and versatility. Only observation is that the "waterproof" compartment between legs is not exactly so. Glad I put my cell phone and keys in a waterproof bag! Kayak is highly visable in the water and remarkably fast. Though a bit difficult to handle on rivers, it is unbeatable on lakes. Handles swells easily and is a lot of fun. Difficult for one person to carry very far, but easy for two. Q: what size scupper plugs does this take?